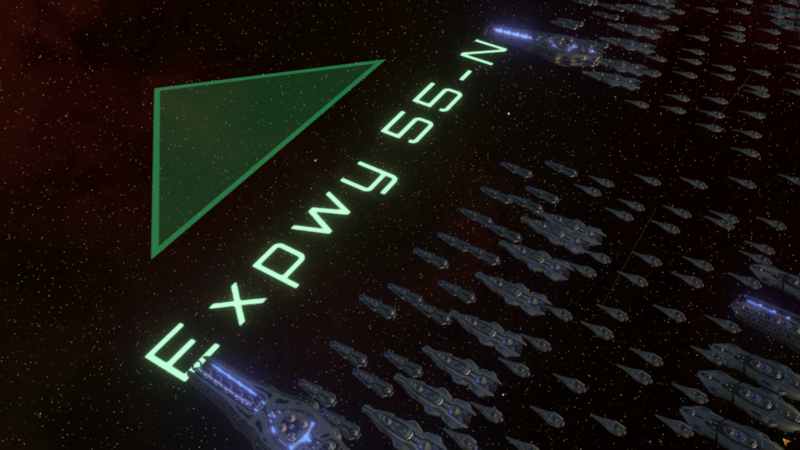 Across local United Nations of Earth (UNE) space, 1.6 trillion hyperlane potholes have been reported by members of the public to local authorities, according to research carried out by Corvette-insurer SaveScum. It obtained the data from 38 sector municipalities, including the central EarthGov authority, which is responsible for the condition of all hyperplanes across UNE space. 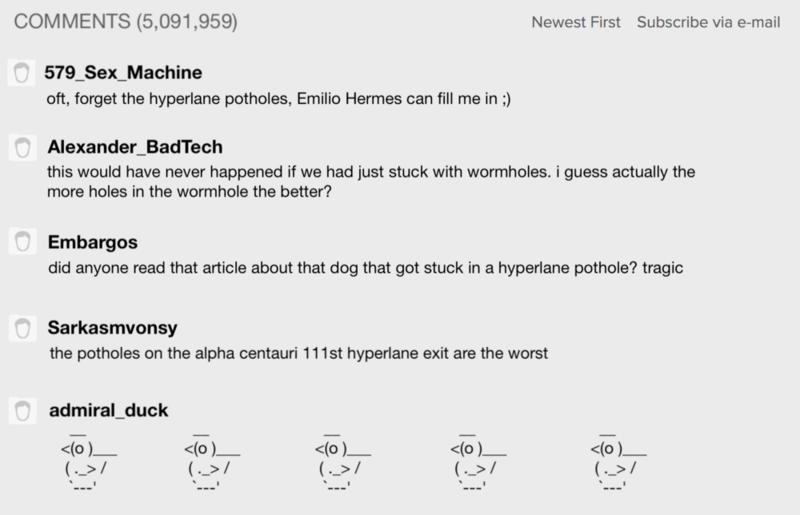 Extrapolating this information, SaveScum believes hyperlane pothole reports have increased by over 9000% in the last year alone. Hyperlane potholes are caused when engine reactor liquid from Corvettes leak into surface cracks on underlying hyperlanes, which in turn expands in freezing space temperatures. The cracks get bigger as more ships fly over them, damaging deeper structures and allowing circular space-time continuum rips to emerge. This can cause damaged shields, broken hulls and distorted passengers in commuters passing by. Hyperlane potholes are also particularly sensitive to inclement space weather, such as meteor showers or Tiyanki-induced solar winds. Jeffrey Rosario, present of the United Nations of Earth declined our interview, but we were directed to his election pledge in 2249 on space infrastructure, in which he stated human space infrastructure repair would be a priority. At the time of press, George Glass had reportedly become so fed up on waiting for a response from local government that he has taken to filling the hyperlane potholes with chunks of hyperlane stolen from the main thoroughfare into Commonwealth of Man space. Area pop marries primitive fungoid, states "I've never been happier"
Image: Yelena Ivanov with her spouse, primitive fungoid IIg, in the background. Yelena quipped; "he's quite shy when I let him out of his cage." When Ulm native Yelena Ivanov split up with her partner of two weeks, the 32 year old thought she would never find love again. But she found love quicker than she ever expected, albeit in a more unconventional manner. Yelena is now happily married - to a primitive fungoid. The former scientist states she's "never been happier" and is "fully devoted" to her genderless fungoid spouse, IIg. "Before, when I've had 'conventional' human relationships, they'd always end badly. My partner and I would come home from work and argue over something petty, like why planets can only have a maximum of 25 tiles. IIg is so different. He doesn't communicate, at least in any form that I can understand, so we don't argue. That's just one example why this relationship is the best thing that's ever happened to me. I don't care what other people say." "It's actually quite a funny story - I was tasked with aggressively observing this little stone age civilization of fungoids on Vurl - IIg was one of the first pops we covertly abducted for living autopsy. But just one look at his mycelium exterior and something stirred deep within me. He - I mean, I think he's a he, that's just what I refer to him as, was thrashing as I approached him and when I unshackled him he wrapped his flagella so tightly around my neck I almost passed out. It was very sensual. From that I knew the feelings were reciprocated and that we were in love." Since returning to Earth, Yelena added that IIg had been a comfort to her following the loss of her job and ongoing arrest warrant issued by the UNE. "My job was very important to me, but I knew IIg was my soulmate. When I tried to convince my colleagues of this they wanted me to get a medbay evaluation. So I did what any reasonable person would do - I freed IIg and we absconded from the station using an emergency shuttle. When I got back to Earth border patrol told me I was under arrest and that I'd lost my job, but IIg did a great job in... incapacitating... them. We've been on the run ever since." Yelena stated that while IIg has settled a life off his homeworld, at first he had some trouble adjusting to Earth. "The first few days back were disorientating for him. He kept trying to run away from me for some reason. Well, not really run since he doesn't have legs, but kind of gyrate away from me, using this trail of slime as lubricant. He's settled down since I put a shock collar around him. It helps to remind him of his time on the observation post. He's been a huge support to me, really. Any time I approach him his tight flagella grips have kept me sane and helped me to manage my sadness and anxiety." Last week Yelena decided to make the couple's love official and petitioned the Space Vatican to officiate their marriage. After her request was approved by Space Pope Belinda Carlisle XI, Yelena and IIg tied the knot in their safe house in Ulm two days ago. Anyway the Asuri are more xenophilic so they'll be more understanding of our love. Also, UNE arrest warrants don't have jurisdiction there, so that will be helpful." Find out more about Yelena and IIg's amazing love story tomorrow morning on Xenonion's Good Morning Space. Image: Paul Bork graduates from Ulm Fleet Academy. Area resident Paul Bork has apologized to family, friends and tutors after discovering he graduated from Fleet Academy with the Fleet Logistician trait. "I'd like to take this opportunity to say sorry to everyone I know. I'm sorry this has happened. If I could take it back, I would. I hope you can all find it in your hearts to still see me as a person. I also hope this event has not damaged the reputation of our proud Fleet Academy." Bork graduated from his 5 year admiralty degree earlier this week, believing this signaled his longstanding career aspirations had finally been realized. "It had started out such a happy day. There I was in my gown with my family, who were so proud. I'd worked so hard and was so pleased with myself. But after I got my degree I suddenly got this pop-up in my eyeStream - 'You have gained the Fleet Logistician trait.' I thought it was a joke at first. But then I looked at it properly. I panicked. I thought it was a mistake. How could this be happening?" "I just wish I could have got the Aggressive or Gale-Speed Traits. Heck, even a Cautious trait would have been better. Who wants to be a Fleet Logistician? That doesn't even do anything to fleet power! Sure, they say it reduces the maintenance of fleets, but you're not exactly going to be building 500 cruisers if you can't afford to maintain them in the first place." Bork initially tried to reach out to classmates and former teachers for help, but they reportedly shunned him for fear of contracting the trait. It is highly unlikely the Fleet Academy will place Bork in a admiralty role, however they have recommended him to consider a career in sector governing. "I never thought I'd see the day when I spent 500,000 energy credits to put my son through a 5 year degree which would allow him to be a... sector governor." The press conference was cut short as local reporters hurriedly left to cover the breaking news story of an area pop's happiness dropping by 1%. Image: Breaking news alert - UNE hysteria over fairly routine orbiting event. A record number of 8.3 billion humans are set to celebrate a fairly inane orbiting event later today on Earth, the United Nations of Earth’s eponymous homeworld. The locally termed ‘solar eclipse’ will see the orbit of Earth’s moon, Luna, line up directly between Earth and Sol, the system’s sun. Planetside, this gives the appearance of Sol being ‘blacked out’, dimming light momentarily. Regarded as a minor space weather anomaly by the majority of other space-faring nations, humans have anticipated the event with fervent hysteria, with many on Earth planning on actually venturing outside and staring directly into blinding light to watch a temporary visibility change. The criticism comes at a time when the UNE’s political reputation in the local cluster is particularly delicate, following a string of recent scandals involving its sitting president, Jeffrey Rossario. Notably despite this, Rossario's opinion polls have actually improved today following the introduction of a mandatory 15-day 'Solar Eclipse Public Holiday' for all UNE citizens. > More accurate reporting from Xan’dolf Leexidanaca could not be possible.